This is an adaptation from “Simple Family Meals”, Mario Batali’s newest contribution to the food world. 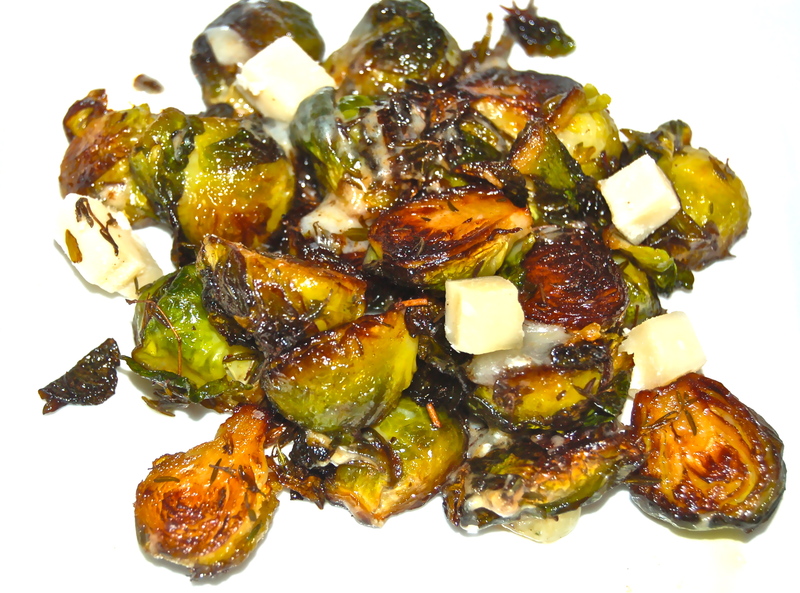 Brussels are a popular vegetable and adding cubed cheese in the last few minutes seemed to me to be a tasty addition. Batali’s recipe called for Pecorino Romana. All I had was grated, so cubed Asiago cheese was the alternative. I would assume Parmesan would work as well. I must say that Asiago did give a tasty boost to the Brussels. 1. Bring a large pot of water to a boil & add the Brussels. Boil for 5 minutes, remove & drain. Slice off their bottoms & cut them in half. Add Salt & Pepper. 2. Heat a saute pan to medium high, add the EVOO & when it begins to ripple, add the Thyme leaves. When they begin to sizzle, toss in the Brussels & saute until tender & brown. At the last few minutes of cooking add the cubed Cheese, & just as it begins to melt, remove from the heat. 3. Divide between two plates & serve.